Being a parent, we have a responsibility to teach our kids manners and to discipline them. Of course, it’s not as easy as kids never want to hear NO and its definitely heartbreaking. Who doesn’t want to see a bright and big smile on their kid’s faces but the thing is that you cannot do that always. Let’s say you shouldn’t do that always. Sometimes its fine but not always. I insist, not always. Otherwise, you are doing more harm than good. You need to learn to choose things that can make your kids happy for the long term. Don’t look for short term happiness goals. Instead, focus on whatever is better for their future. So, the hard part is when you apply this “NO” and see the reaction of your kid. It’s not going to be easy, I understand but you have to be firm and be consistent. Don’t give your kid the benefit of doubt. 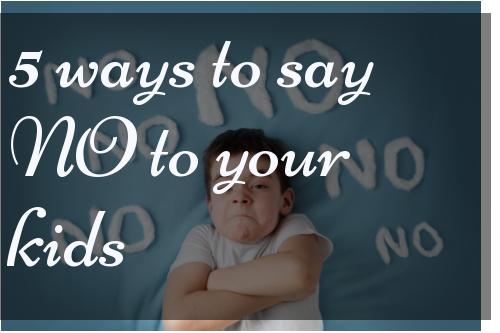 They shouldn’t expect a YES from you after crying and insisting. Be sure your facial expressions and tone are serious and firm in telling them that “NO”, they cannot have that candy or another ice cream. Let me clear one thing if you think your child is manipulating you into saying YES because he knows you will give up eventually. You have to change it right now. Come, have a look at FIVE ways you can change this habit and get results. Do not shout in any case. Whatever the reason is, just don’t shout. This way you will lose the situation before even handling it. Even doctors say that shouting is harmful to kids so please just try not to shout. I understand that the urge to scream is too much but being an adult, you got to understand that you are not a child. Talk to your kids with love and give them valid reasons as per your situation. Try if that helps. Give your kids alternatives. For example, if your kid is asking for a cookie when its dinner time, simply tell them they can have it after having dinner. Encourage them to finish their plate so that they can get a cookie earlier. This strategy helps me always and I am sure it will help you too. Engage them in any other activity or conversation. When they are no longer interested in that new toy because you are talking to them about their favorite tv show or their dinosaur drawing, they will not even remember that they wanted a toy. Tell them you will do a specific activity or get them that special gift on their birthday. Or when they get good grades, they can get that ice cream or anything they want. Say NO that time but fulfill their request later whenever you think its fine. This way they will trust you that you actually listen to them and next time when you will say NO, they will automatically understand. Make sure you know the weakness of your kids. This way you can turn the situation better. Like for example, my kid loves balloons so I keep them in my bag always. I know that I would have to say NO a million times when I am outside so I blow balloons for him when he is not happy. if you are saying NO but your spouse is saying YES, this will create confusion and your kid will take advantage of the situation. Don’t let that happen. If one of you is saying NO, another one should say same. So that your kid will understand that mom and dad think alike and the decision is final. I can understand how tiring it is to deal with kids especially toddlers and preschoolers but with right ways and loads of love, you can discipline them. Yelling or spanking is not the only way. Just A supertiredmom with superactive kids.